The future of the Black Rock monument, the world’s oldest Irish Famine memorial, dedicated to the thousands of Irish immigrants who died on Montreal’s waterfront in 1847, is looking bleak. 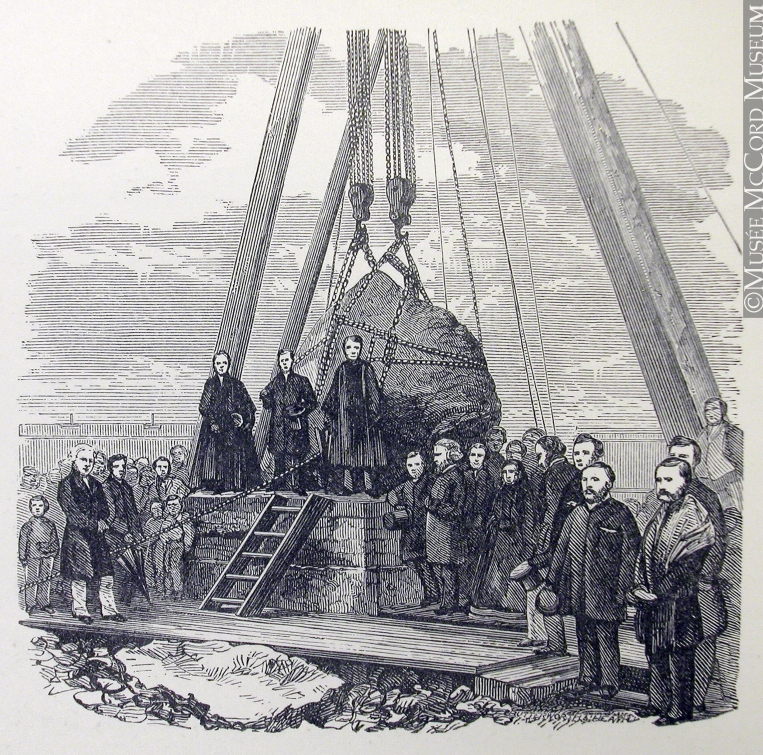 Once again, the stone, a huge boulder pulled from the bed of Canada’s St. Lawrence River, and erected in 1859, is being said to stand in the path of progress. It’s not the first time. It was moved to its present location, between traffic lanes on Bridge Street, near Victoria Bridge, in 1901. Then it was the Grand Trunks Railway line expansion project that relegated the memorial to the traffic island in the middle of the busy thoroughfare. The stone, which is over ten feet high, stands guard over the remains of thousands of Irish immigrants who died of typhus fever in 1847. They were buried in trenches along the St. Charles River. 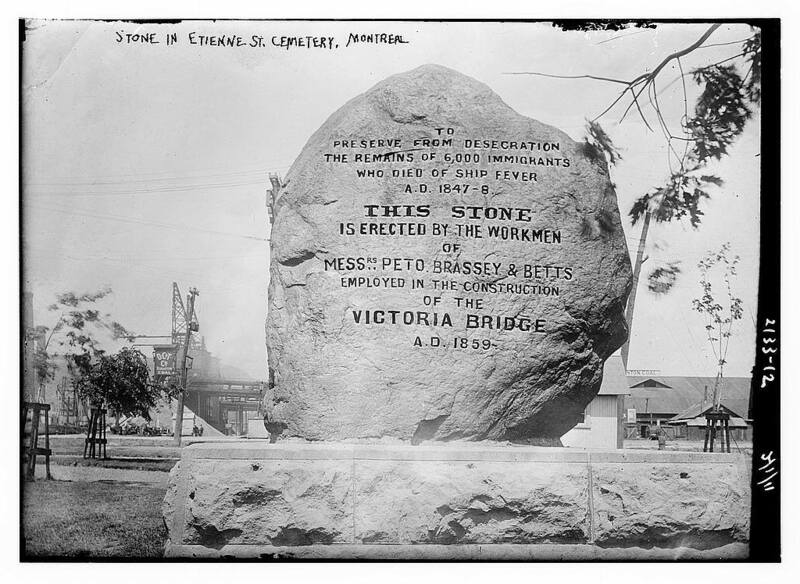 Workmen building the Victoria Bridge in 1854 -59 uncovered some of the bodies, and erected the stone in memory of those who died. The summer of 1847 was a particularly bad time. Forty vessels containing 14,000 Irish immigrants waited in a line extending two miles down the St. Lawrence River. The ships were crowded and disease-ridden, and between 3,500 and 6,000 Irish immigrants died of typhus and dysentery. They are buried in mass graves on Grosse Ile, the island that served as the quarantine station, 30 miles from Quebec. Of the passengers who made it to Montreal, which received the biggest influx of immigrants, many were already ill from disease and malnutrition, and they died in hastily erected “fever sheds” along the St. Charles river, and were buried in trenches. These were some the bodies uncovered by the bridge builders. Over the ensuring years, other bodies have been recovered, and their remains have been reburied near the Black Stone. It’s unseemly that once again, the last resting place of these poor souls should be disturbed. The Irish of Montreal, have long sought to find a better spot for the stone, and beginning five years ago, they began generating plans to construct “Montreal Irish Monument Park” on a parking lot on Bridge Street near the rock’s current location. 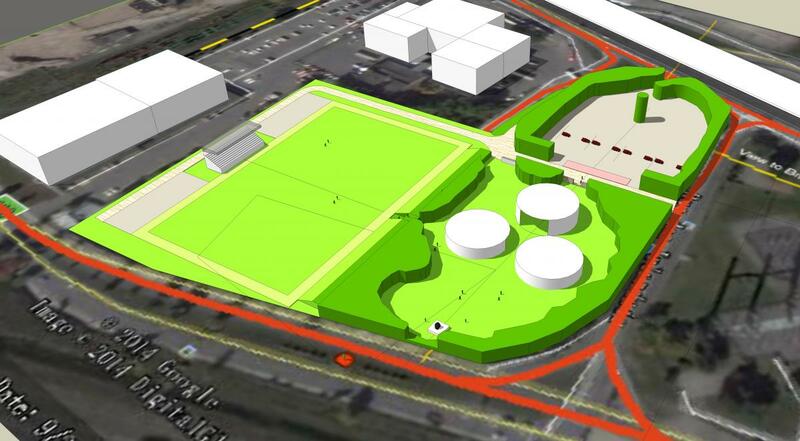 But in May, organizers learned that the chosen space had been purchased by Hydro-Québec to install an Réseau électrique métropolitain (REM) train substation. 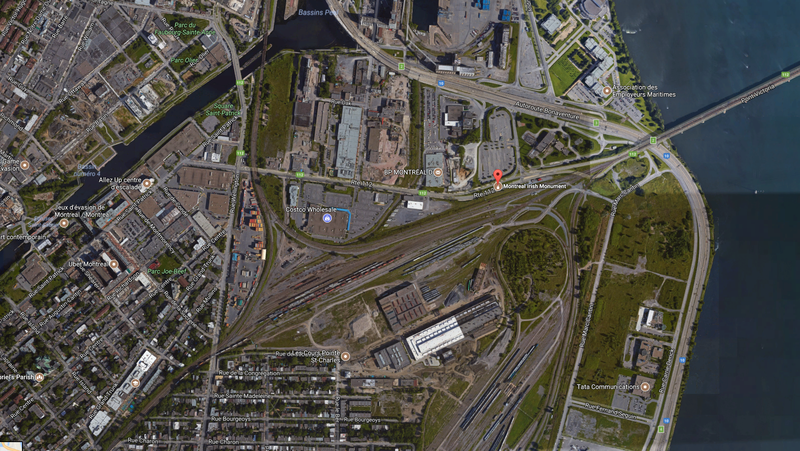 Montreal Mayor Denis Coderre, who had initially supported plans for the park, now says that the substation must go ahead. “The Irish have been asking for a memorial park there since 1907,” said Fergus Keyes, a director of the Montreal Irish Monument Park Foundation, in an interview on CBC’s Daybreak. For more information visit montrealirishmonument.com. To read Irish America’s article about the monument from our January / February 1996 issue here.